A poignant graveside ceremony was held in Inverness yesterday to commemorate the 50th anniversary of the death of two police officers in the line of duty. Detective Sergeant Evan Lumsden and Constable Iain Ritchie died together in the Caledonian Canal on November 3, 1968, after getting into difficulties during an underwater search for a missing person. DS Lumsden, a 37-year-old husband and father of five children, and Mr Ritchie, a doting 21-year-old brother to his two siblings, were part of the Inverness Burgh Police sub aqua team when they became trapped in a lock sluice at Corpach. Their tragic deaths left “a cloud of grief” over Inverness and the Highlands. They remain just two of six policemen to have died in the line of duty in the region during the last 150 years. Emergency service personnel from the police, fire and ambulance services joined local councillors, family members and local residents to pay their respects to the pair, who are buried side by side at the city’s Tomnahurich Cemetery. Retired police sergeant David Conner began the tradition of holding a commemoration ceremony three years ago to keep their memory alive. He said: “I think it’s so very important we must never forget the sacrifices that people have made for the police or fire brigade. They gave their time and their life. “Every policeman, every firefighter, every emergency services personnel’s first priority is to get home safe 999 times out of a thousand, that’s how it works. “Sometimes, you might return home a bit battered and bloodied but you would still be home. But the thought of someone coming to your door saying your dad’s been killed…. 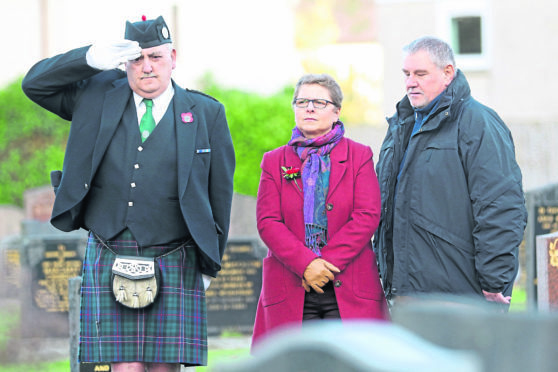 Following a prayer from Derek Morrison, a retired police officer, Pipe Major Steve Spencer of the Northern Constabulary Pipe Band played a lament at their graveside. Mr Conner added: “We have lost six police officers and two firemen in the whole of the Highlands and Islands in over 150 years. “It seems small, but it is still six cops and two firemen too many.